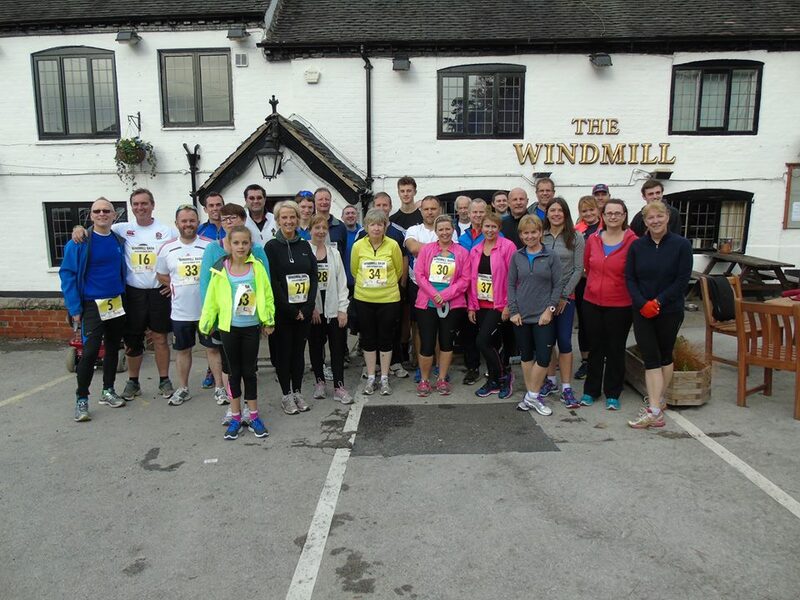 25th October 2015 - The 16th Annual Windmill Dash. Times with positions in brackets. There were 33 runners in today's race.Table of Windmill Dash Times. I set off at 1:45 and walk round with Holly in the carrier, we take 45 minutes. 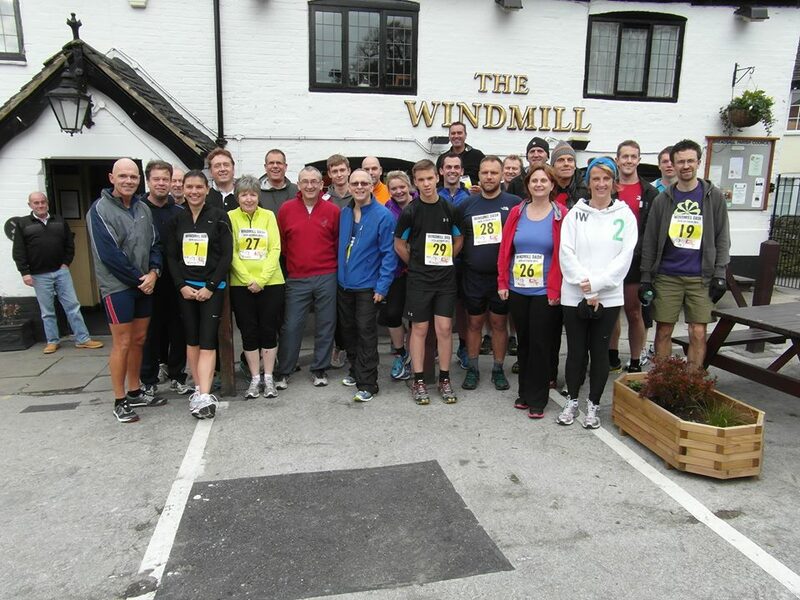 26th October 2014 - The 15th Annual Windmill Dash. Times with positions in brackets. There were 26 runners in today's race.Table of Windmill Dash Times. Stay till 7pm at the Windmill in order to recover. Robert has brought a LED clock to display the times, however this causes his keys to get locked in his car, delaying the race start. Rain and windy during the start. The finish on the jitty is videod for the first time. Also this year we have our own Windmill Dash Facebook page. 16th September 2007 - Derby Triathlon Zero effort, zero acheivement. 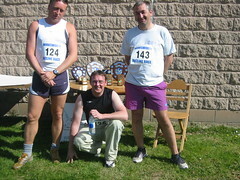 7th May 2007 - Take part in the Southwell Trial Race organised by "Running with David" with Simon Grundy and Annette. A very flat 5km trail race starting at Southwell. Have a couple in the town afterwards to recover. 15th April 2007 - Take part in the Wirksworth Incline Race with Simon Grundy and Pete Kirkland, Annette takes the pictures. Have a few in the Black Swan at Idridgehay to recover afterwards and then down to Cromford meadows for a BBQ and a swim in the river. 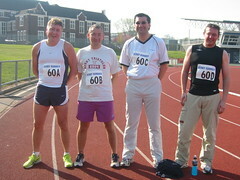 8th April 2007 - Take part in the Livingston Relay race at Loughborough University with Simon Grundy, Pete Kirkland and Brian Booth, Annette takes the pictures. Three mile relay race with a top class field. We all get rather worried when people complete the first leg in a shade over 15 minutes. Have a few at the Otter by the canal to recover afterwards. 17th September 2006 - Derby Triathlon Start time is 10:37:30. David starts 4 minutes behind me. I swim breaststroke all the way. Go very well on the bike, DT does not pass me till after 6 miles. 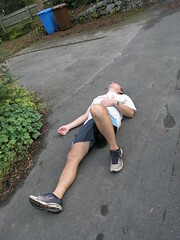 I am very tired during the run and struggle towards the end. Have a couple in the Spread Eagle and a Sunday lunch. Give David a lift back to Rolleston, go along Marston lane. Annette and I drive down the night before and stay in the Lincolnshire Poacher. A very hot day for the event. 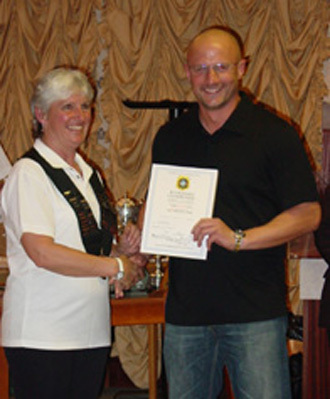 22nd May 2005 - I do my first outdoor swim, 1K at Colwick Park in a time of 0:25:26, breast stroke. David does the 4K senior race. 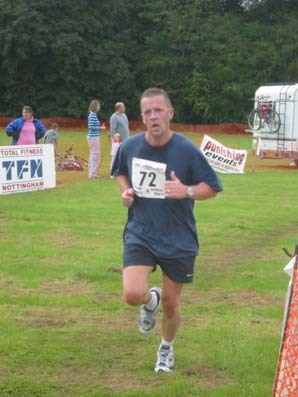 31st October 2004 - Windmill Dash, I am quite pleased to just run all the way round. Simon Flear wins. 11 runners. Have a couple of pints and a bite to eat in there. 12th September 2004 - David is devastated to be beaten by the Brian's jumper relay team. I am amazed that my Uncle John starts the event in the next lane to me, racing for Mayfield Carpets. 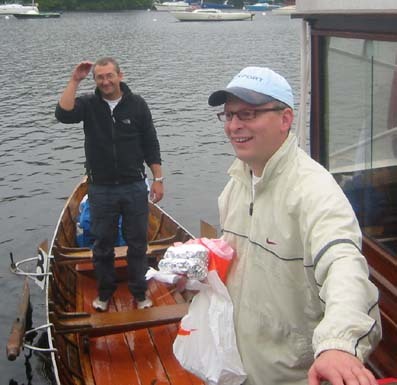 4th September 2004 - Me and Robert support David as he swims Windermere. 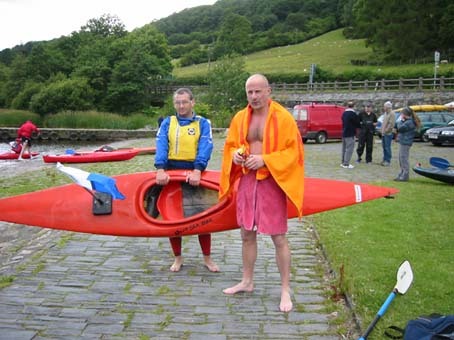 10th July 2004 - I support David as he swims the Lake Bala Swim. 26th Oct 2003 Windmill Dash, I run until the village and then walk. My worst performance so far. Good food in the Windmill. Stay in the pub till about 8pm. Annette goes down town with Robert and Doll. 15th September 2002 - Derby triathlon, Brian has a bad back, so just me and David entry in team �Caesar Salad� I enjoy the event very much. Andrea and Brian come along to support. Have a couple of pints in the Hawk and Buckle afterwards. Brain picks me up and we head into town. Me, Brian and David go for a Pizza Express, Sloppy Josepie and pepperoni and a bottle of red wine. Have one out the back in Walkabout, Blue Dog, Crown and Cushion for a lot and singing, Pappas Pizza. The lads go home and me, Doll and Anna go to Heroes, Flares and then taxi home. About 12 pints apparently. Sunday 4th Nov 2001 - we do the Dovedale Dash again. 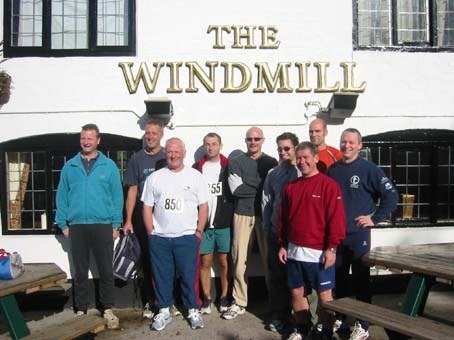 28th October 2001 - The 2nd Annual Windmill Dash. I am camping at Drum Hill with the Scouts for the weekend. I get down to the Windmill for 11am. I set off at a good pace and keep to it, followed closely by Wayne. We are almost caught at Breadsall island by Robert. I pull ahead but he catches me by the shop. I struggle to run up the jitty. I finish second in 34 minutes. Lee Mansfield comes to watch. There are 9 runners this year. I have a couple of pints and some food in the Windmill. Pick up three cooked chickens from Morrisons and rush back to Drum Hill. 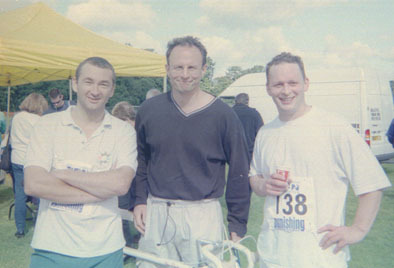 Me, Rob and DT entered our first Triathlon event on 16th Sept 2001. Robert was elated to beat his brother. It was organised by Punishing Events. There is some debate afterwards about my navigation on the cycle route. 5th November 2000 - The First Windmill Dash. The Dovedale Dash is cancelled so have have our own race. 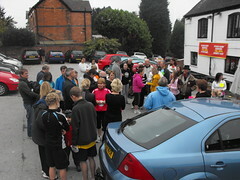 Start at about 11am, the route is down to the Coach and Horses, along to Pektron, through the village and then up the jitty. I have a very steady run, finish in 36 minutes. Robert just beats David, they both take about 32 minutes. There are 7 runners. Have a few in the Windmill and then into town. Go for a meal at the Shing-do. Bro walks out after one of his spring rolls goes missing, returns after 5 minutes for his jacket. 8th May 1994 - Complete the Prime Homes Derby Half Marathon. Run with Simon Wellings and Brain Booth most of the way. Party at the Taylors later. 26th September 1993 - Complete the Robin Hood Half Marathon in 1:54:13. 23rd May 1993 - Complete the Prime Homes Derby Half Marathon in 1:54:35 I had been very confident of beating last year time, but go too fast and end up walking through Derby. Party at the Taylors later. 10th May 1992 - Complete the Derby Ramathon in 1:49:02. 1700 people take part. Party at the Taylors later.